Robots--including those in both manufacturing and surgery--may end up showing more dexterity than ever, thanks to a wave of sensor advances. GelSight CEO Bill Yost, for example, sees potential in the space for the MIT-developed sensor technology the Cambridge, MA-based company has been seeking to commercialize, even though the company is concentrating on other sectors for now. GelSight might show promise determining whether skin cells or cancerous, or conducting a prostate exam, or even engaging in robotic surgery, according to Yost. The company is already working with cosmetics and shaving supplies companies when it comes to using the sensors to determine the effectiveness of their products. "It's not our resolution that makes us unique. It's our ability to image surfaces without reference to their optical properties," Yost says. GelSight uses a small block of elastomer with a reflective coating on one side to remove the optical characteristics that would, say, make it difficult to visually capture a fingerprint. "We cover over your finger or an object with a highly engineered membrane that is thin or compliant enough that we can then call on some machine vision algorithms," Yost says. The sensor is able to detect the ridges and depressions of a three-dimensional structure. This trait is especially important when it comes to biological materials because many such materials are translucent. Researchers from MIT and Northeastern University recently demonstrated that GelSight technology could allow a robotic arm unprecedented dexterity abilities, opening the door to a myriad of applications, according to an MIT news release. GelSight could eventuall mean better robots for the manufacturing industry, as well as possibly in the operating room. While robots still lack a sense of touch--a human sense that is extremely hard to replicate--their level of dexterity is steadily increasing. (Yost notes that GelSight is able to sense texture differences of a few microns.) Other advances in dexterity include Machester, N.H.-based DEKA's Luke arm, a prosthetic limb capable of grabbing an egg without inadvertently breaking it. The groundbreaking research in robotic technology at MIT as well as Northeastern University could improve robotic dexterity even more. Researchers believe this sensor could really push the envelop in various application domains because of its ability to see heights on the level of tens of microns, providing a much better spatial resolution. 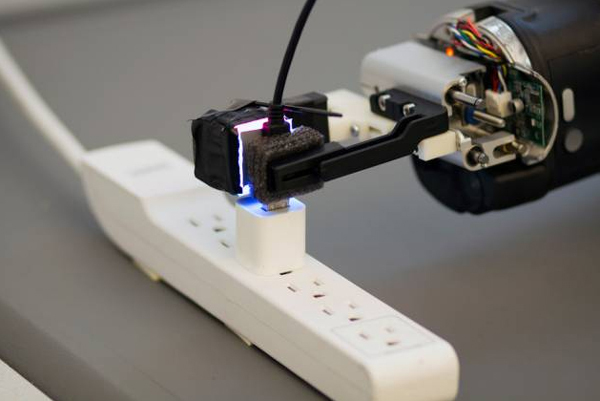 Daniel Lee, a professor of electrical and systems engineering at the University of Pennsylvania and director of the GRASP robotics lab, spoke to MIT news about the potential of the sensor. "As roboticists, we are always looking for new sensors," he said. "Having a fast optical sensor do this kind of touch sensing is a novel idea, and I think the way they're doing it with such low cost components, using just basically colored LEDs and a standard camera, is quite interesting. It could be developed into a practical device." Researchers are still exploring various applications for the new technology, as possibilities for the sensor emerge in the medical technology manufacturing realm. NASA recently developed similar technology to help perform certain tasks in an effort to free up human time and resources. As researchers continue to struggle to equip robots with the ability to firmly grasp and move with precision, the GelSight sensor could be a revolutionary breakthrough. "People have been trying to do this for a long time," said Robert Platt, an assistant professor of computer science at Northeastern University, and the research team's robotics expert. "They haven't succeeded because the sensors they're using aren't accurate enough and don't have enough information to localize the pose of the object that they're holding." The researchers recently presented their results at the International Conference of Intelligent Robots and Systems. The team from MIT designed and built the sensor, while the team from Northeastern developed the robotic controller and conducted the experiments. While it may be several years before we see robots performing major surgery with any sort of regularity, robotics continue to extend their reach into the world of manufacturing and medicine. As they continue to develop their prototype, researchers are hopeful that continued improvements can take robotics technology to new unforeseen heights.